DENVER (AP) — A historic Colorado mountain town is on the threshold of a transformation after the federal government announced it will embark on an ambitious campaign to stanch the flow of acidic wastewater cascading from abandoned mines. 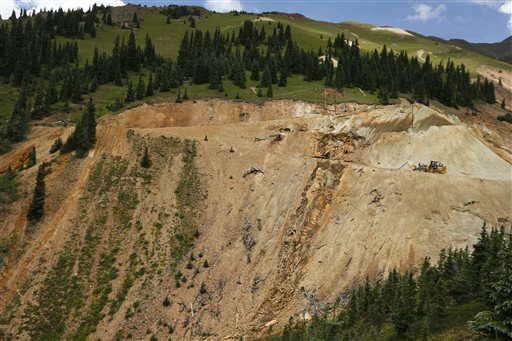 The Environmental Protection Agency on Wednesday designated an area north of Silverton as a Superfund site, clearing the way for a multimillion-dollar cleanup that could last years. “I think we’re all in for one heck of an adventure,” said Mark Esper, editor of the Silverton Standard newspaper. 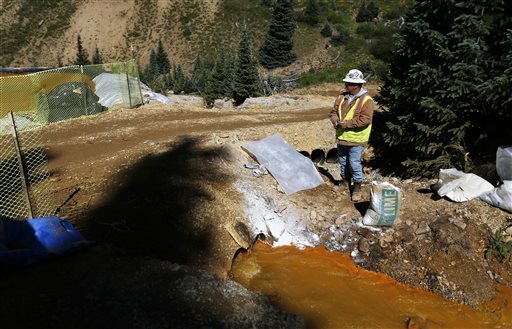 Tainted wastewater has been flowing from idle mines in the San Juan Mountains for years, but some of Silverton’s 600-plus residents resisted a Superfund designation, worried it would discourage tourists and skiers. Silverton is best known for the steam-powered Durango & Silverton Narrow Gauge Railroad and the Silverton Mountain ski area. But when the EPA accidentally triggered a 3-million-gallon wastewater spill from the Gold King Mine in August 2015, contaminating rivers in three states, public opinion shifted. Silverton and surrounding San Juan County got behind the Superfund listing. “It has been a stunning turnaround,” Esper said. He said he wasn’t sure of all the reasons for the reversal, but others have said residents recognized that a long-term solution was urgent and only the federal government could afford it. “People I thought never would be supporting Superfund totally reversed,” he said. Silverton Town Administrator Bill Gardner said he was “tremendously happy” with the Superfund listing. “What a great benchmark for this community and for our downstream partners,” he said. He praised the EPA for listening to the town’s concerns. The agency calls the project the Bonita Peak Mining District Superfund Site. It includes 47 other sites besides the Gold King, most of them mining-related. The EPA has already been at work in the area, building a temporary treatment plant to clean up water still flowing from the Gold King, sampling water and sediment and assessing fish and wildlife habitat. That process will probably end next year, said Rebecca Thomas, EPA’s manager for the project. The agency will then study different cleanup methods, choose a preferred option and ask for public comment. Work would then start on designing and implementing the cleanup. Fixes could include water treatment plants for acidic waste draining from the site, plugging abandoned mines that are leaking and moving mine waste piles away from streams, Thomas said. It’s too early to say how long the cleanup will take or what it will cost, Thomas said. The EPA estimated that the Gold King blowout sent 880,000 pounds of metals into the Animas River in Colorado, including arsenic, cadmium, copper, lead, mercury, nickel and zinc. Utilities and farmers temporarily stopped drawing water from the rivers for drinking and irrigation. The EPA said water quality quickly returned to pre-spill levels. Public pressure on the EPA has been intense. An investigation last year by the Interior Department, which is independent of the EPA, said the cleanup crew could have avoided the spill but rushed its work. Interior officials said they found no evidence of criminal wrongdoing. A separate criminal investigation is still underway, along with an internal EPA inquiry. Congress has conducted multiple hearings. New Mexico has sued both the EPA and Colorado over the spill, while the Navajo Nation sued the federal government. Utah officials say they also plan to sue. Acting New Mexico Environment Secretary Butch Tongate said his state and other downstream jurisdictions were excluded from some of the Superfund planning. “We will persist in our fight to protect New Mexicans and to hold EPA fully accountable,” he said in a written statement. Esper said Silverton could become a research center for cleaning up leaking mines across the nation. The Government Accountability Office estimates that at least 33,000 abandoned mines across the West and in Alaska are contaminating water or causing other environmental problems. The Colorado cleanup might also improve the town’s finances, which have been in decline since a mine and mill closed in 1991, Esper said. “I think people are really optimistic in the future of Silverton. I don’t think we see Superfund as being a hindrance to that,” he said.